Thursday, April 12, 2007, 00:00 by Angelo Zahra, Zejtun. 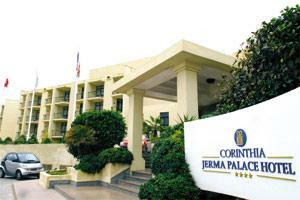 I was deeply moved watching television news of the closing down of the Jerma Palace Hotel. This for two reasons, one seeing people, especially those over 50, crying about losing their jobs and the close bond that existed between the employees in the various sections of this hotel, some having worked there for over 25 years. Secondly for the great loss to the south of the island of the only prestigious four-star hotel, which was well patronised by tourists and by locals entertaining themselves during the weekends. This hotel was opened in 1982. It was built to help the island in employment and tourism by the Libyan Jemahirija, through the close personal friendship of Prime Minister Dom Mintoff and President Muammar Gaddafi. President Gaddafi also had a presidential suite in this prestigious hotel. The land where the hotel is built was given over through an act of Parliament purposely for the building of this hotel and for nothing else. The hotel was owned by Lafico, a Libyan state company, and leased and operated by the Corinthia Group. So Lafico were being paid the leasing fee, and Corinthia was operating the hotel. Through this system both companies were making a decent profit. No official news was released on the reason for the closing down of this hotel, but rumours are that it is making space for luxury flats to be built by the new owners. On November 22, 2006, when the closing down of this hotel was only a rumour, during an extraordinary general meeting of IHI, which was also attended by a Lafico director, also sitting on the board of IHI, I made a suggestion regarding this hotel but was ruled out of order by the chairman of IHI who also happens to be the chairman of the Corinthia Group. I have no doubt that Lafico made huge profits out of this sale, if this hotel was sold to third parties. They have every legal right to do so, but surely they have no moral right when the land was given to them by the people of Malta purposely for the building of a hotel in the south through an act of Parliament. Moreover, they have no moral right to probably invest these huge profits in other companies operating in other parts of the world. I appeal to the government and Opposition not to approve or be part of this massacre of the south which is already destroyed by the fish farms, the refuse recycling plant, and the power stations. The land was approved by Parliament purposely for a luxury hotel and should be kept as a luxury hotel. Do not be a part of the clan responsible for this new massacre.